Oh, I just love the start of a new year! It’s fresh! Don’t you think? We get a chance to focus on intentions and what we can do to make it the best year ever. If you’re like many of us, the new year brings new healthy intentions. Maybe it’s to meal prep more. Maybe it’s to try new recipes with your family. Maybe your New Year’s intentions are to finally feel good and nourished. Well, I have good news. You can do all three with this Gluten-Free Tangy Pineapple Turkey Meatballs recipe! Meatballs are a favorite in our household, mostly because you can make them in a variety of different ways. 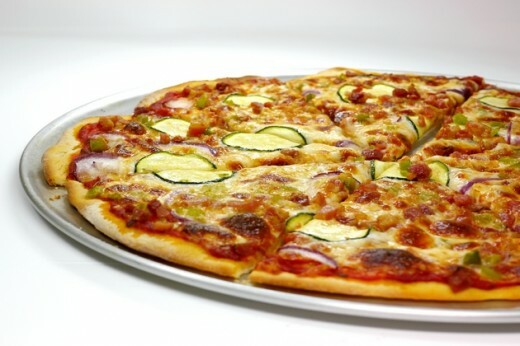 Italian, Spicy, BBQ, and more. You can serve meatballs as a main dish, appetizer or high protein snack. The opportunities are endless. But like I mentioned above, our focus for the New Year is healthy, easy, and gluten-free. That being said, let’s discuss meatballs. When you think of meatballs, you usually think one of two things. Mama’s meatballs or Swedish meatballs. Right? Both are tasty, but probably not that healthy nor gluten-free. Back in the day, my mom used to make meatballs by mixing beef or pork meat with white breadcrumbs and loads of cheese. Again, super tasty, but not the best when you’re trying to eat gluten-free or focusing on healthy intentions. Which leads me to my next focus. 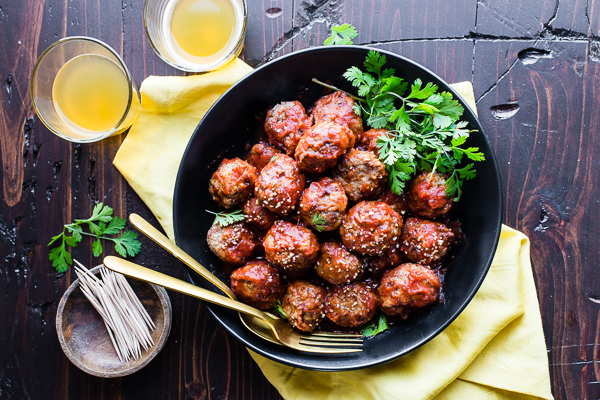 How can we make meatballs gluten-free, healthy, and still super tasty? Well my friends, it’s truly simple. All you need are the right real food ingredients and the right kitchen tools. These Gluten-Free Tangy Pineapple Turkey Meatballs require simple ingredients and just a few easy steps to make. 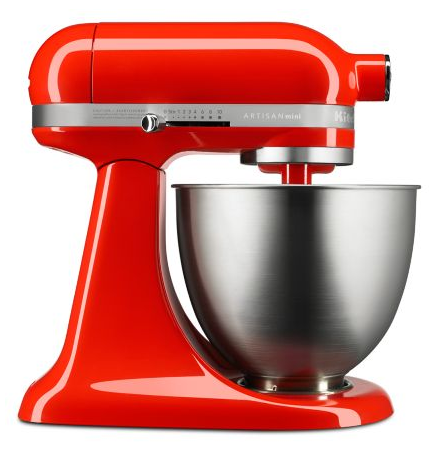 I use my KitchenAid® Artisan® Mini Stand Mixer to quickly mix the turkey, egg, gluten-free starch, and pineapple. It’s the key to getting the right texture for these meatballs! Plus, it saves so much time and mess by mixing it for you. The Artisan® Mini Stand Mixer has the same power as the full-size KitchenAid® Tilt-Head Stand Mixers while being 20% smaller, 25% lighter, and extremely versatile. Another reason why I love using it — its efficiency! Roll your meat mix into meatballs and pop these in the oven to lightly bake. This keeps them together before you coat them with the tangy sauce. While the meatballs are baking, assemble your tangy sauce. If you’re using canned tomatoes, make sure they’re drained. Place the onion, crushed tomatoes, ketchup, vinegar, honey, red pepper flakes, garlic, and salt and pepper in a blender or food processor. Blend on medium high until smooth and creamy. Taste to see if the spice and seasoning is to your liking. Once the meatballs are out of the oven, combine the sauce and meatballs in an 8″ skillet from the KitchenAid® Tri-Ply Stainless Steel 10-Piece Set with your tangy tomato pineapple sauce. Let the meatballs simmer with the sauce to get all that extra flavor! Remove from the skillet, garnish with cilantro and serve or save for later. See, easy peasy! A healthy gluten-free appetizer or meal ready in 45 minutes ya’ll! My recommendations? 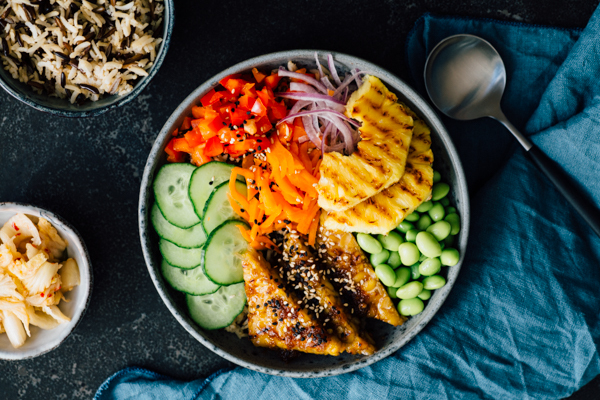 Serve with zucchini noodles for a vegetable-packed pasta bowl! Or double the batch, freeze half for you, and serve them at your next football-watching party. No one will ever guess they are healthy and gluten-free since they’re plain, delicious and flavorful! Share your take on these Gluten-Free Tangy Pineapple Turkey Meatballs on Instagram using #MadeWithKitchenAid for a chance to be featured. Place the ground turkey, pineapple, garlic, onion salt, pepper, tapioca, chili powder, and egg into the KitchenAid® Artisan® Mini Stand Mixer. Mix on medium speed until all the ingredients are combined. Roll the combined ingredients into balls (a little bigger than golf ball size). Place on a greased baking sheet and bake for 12-14 minutes. While the meatballs are baking, assemble your tangy sauce. First, make sure your tomatoes are drained, if you’re using canned tomatoes. Place the onion, crushed tomatoes, ketchup, vinegar, honey, red pepper flakes, garlic, and salt and pepper in blender or food processor. Blend on medium high until smooth and creamy. Taste to see if the spice and seasoning is to your liking. Feel free to add more red pepper flakes or salt and pepper and blend again if desired. 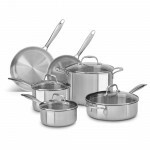 Pour the tangy sauce into the 8″ skillet from the KitchenAid® Tri-Ply Stainless Steel 10-Piece Set. Bring the sauce to a soft boil then reduce and simmer for 3-5 minutes. Once meatballs are baked, remove them from the oven and place in the sauce. Add 1/2 cup more crushed pineapple to the 8″ skillet. Simmer for 10-15 minutes while coating the meatballs with the sauce. Remove from heat and garnish with cilantro and red pepper. Sprinkled with brown sugar to top. 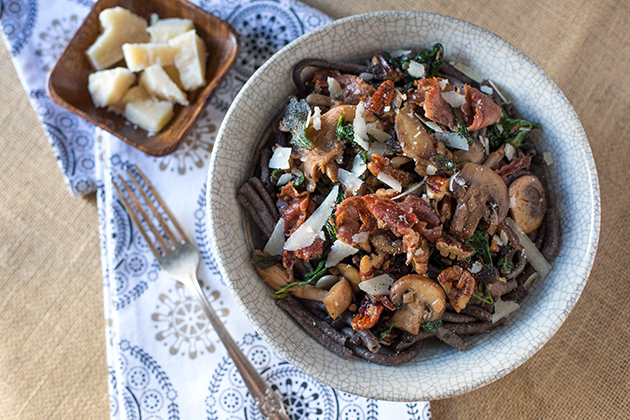 Serve with rice, gluten-free pasta, vegetables, zucchini noodles or even as an appetizer!